From the moment you step onto Belmond Royal Scotsman, you are swept up in a world of myth, legend and timeless luxury. Delve into a land of soaring peaks and deep valleys, mirror lochs and looming castles. Enjoy a tasting in a world-famous distillery, then enter the forest for an exhilarating clay pigeon shoot. As night falls, mingle with fellow guests over candlelit dinners and live ceilidhs—a fine finale to the day’s adventures. The train first launched in 1985. 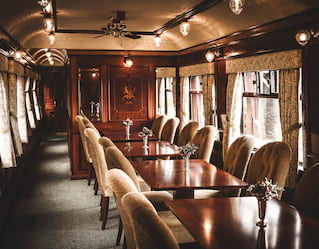 Following a whirlwind five-year operation of award-winning success, the original carriages were retired and replaced by a new set of Pullman cars to be renovated by James Park Associates. Lacquer-polished wooden-panels and warm tonal fabrics perfected the Edwardian country-house appeal. En-suite cabins, complete with steamy showers, established unprecedented comfort and the birth of a luxury legend. In 2007 the train was christened Belmond Royal Scotsman and has continued to raise the bar of style and innovation since. The recent addition of the Bamford Haybarn Spa carriage marks a world first in the pursuit of perfect pampering. A true chieftain of the rails, Belmond Royal Scotsman is an awe-inspiring way to delve into the soul of the Scottish highlands. Unveil the spirit of Scotland with our inspired itineraries. Whichever journey you pick, each day brings a host of exciting excursions. Step through the pages of history at Glamis Castle, Eilean Donan Castle and Culloden Battlefield. Revel in Scotland’s whisky heritage with a dram or two at world-class distilleries. 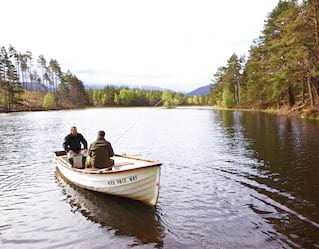 Famed for its sporting adventures, Scotland is the perfect place for outdoor pursuits. Enjoy clay-pigeon shooting and fishing, or tee-off at championship courses with our special golfing itineraries. From ancient strongholds to wild natural wonders, Belmond Royal Scotsman promises a truly enchanting escape.